A friend of mine coined a phrase that has stuck with me. She said that in order to hand-knit something for a friend or acquaintance they had to be knitworthy. Knitworthy is not an overall measure of the quality of a person, but a judgement on their ability to appreciate handmade gifts. Gifts that usually cost more to make, in materials alone, than it would cost to buy similar objects. Gifts that take your time and effort to produce. Gifts, to be fair, that are sometimes lopsided and funny looking but come with all kinds of personality built in. Lots of wonderful people are not knitworthy. Let me provide a parallel example. I am not foodworthy. Inviting me over for a fancy four-course meal is an utter waste of your effort. I am a simple eater and cannot tell the difference between a meal that takes 4 hours of sauteing, braising, and chopping and a crock pot meal. Do not waste your culinary wizardry on me. Invite over another friend. Oh, and if you are serving fancy wine, just pour me some water and enjoy it yourself. $15 and $50 bottles of wine are the same to me. I am a nice, good, lovely person who does not have the palette to appreciate fancy food. Today, I presented one of my dearest knitworthy friends with three hats for her kiddos. When baby number one was born she got a teeny sweater. When baby number two was born the new baby and her sister got coordinating hats. Now that baby three is here, the only option was to make all three girls hats. They were so fun to make and give. I loved thinking about each girl and customizing the colors and the topper for her individual hat. I loved giving them to my friend the day after the first big snowfall of the year and knowing her girls heads will be warm all winter. I love that she slipped the teeny one on her baby’s head before they went outside, so she wore it home. She is totally knitworthy. Spending my time and energy making her kiddos stuff makes me so happy, makes her happy and makes her kids happy. I can’t wait until they are teenagers and she and I can torture them with “another batch of hats from auntie Johanna”. I think then I’ll make sure they are really itchy too. She and I will then appreciate how my knitting skills can be used for good and evil. Hmmm, I should start learning about GPS trackers too. I could embed them into the hat so we can see what trouble her girls are getting into. 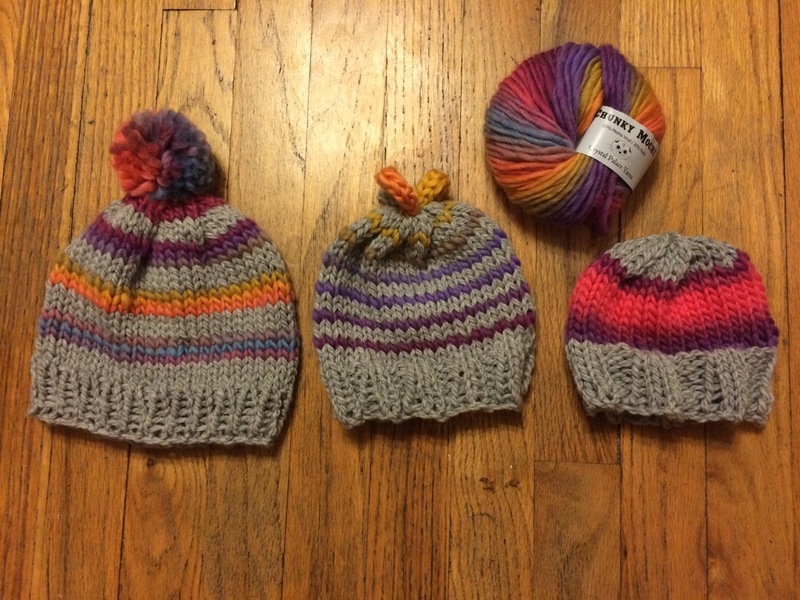 I love the self-striping yarns–they look so great in those hats, too.